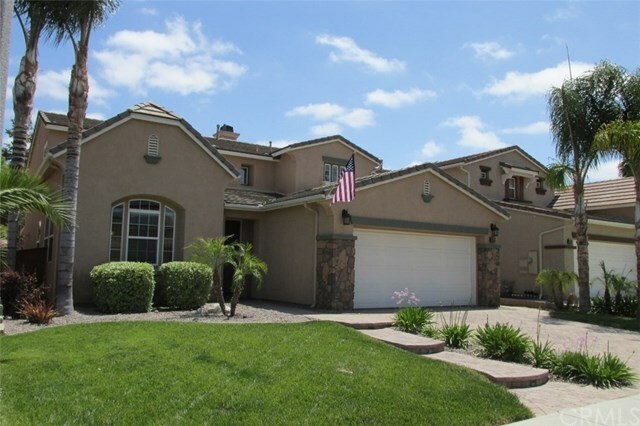 Lovely home on a quiet, tree-lined street near the Golf Club at Rancho California in Murrieta. 5 bedrooms, 3 bathrooms, including a bedroom/bathroom downstairs. CUSTOM PAVERS on the driveway and front walk. Large kitchen includes GRANITE COUNTER TOPS, CERAMIC TILE FLOORS, HUGE ISLAND, newer appliances, breakfast nook, and plenty of cabinets. Family Room off the kitchen with gas fireplace, built in entertainment center, and surround-sound speakers. Living/Dining Room combo currently used as pool room. (Pool Table is negotiable). Master Suite with walk-in closet, dual vanities, soaking tub and separate shower. Computer niche with built-in desk. Covered Rear Patio. BUILT IN BBQ plus California Room in the backyard. THREE CAR TANDEM GARAGE. NO HOA AND LOW TAXES!! Close to the Promenade Mall, Golf, Restaurants, Schools, and Entertainment. Get this home before someone beats you to it! Please click on the virtual tour for more photos.